We have posted many photos of our beloved Anna on this website and written many funny captions for those used in our snail-mail newsletter. She was smart, sweet, and joyful. On 9 May, she was diagnosed with a cancerous mass on her spleen and another on her heart. She was not a candidate for surgery, but she started chemo. 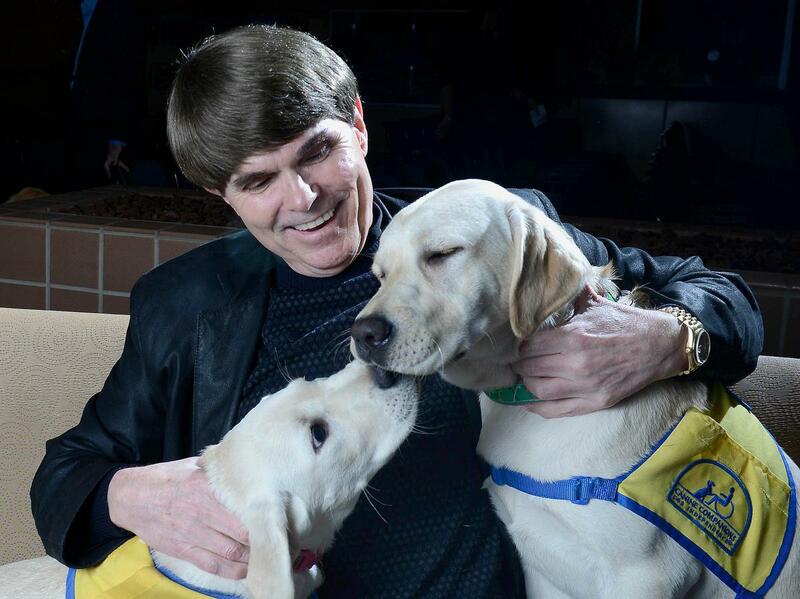 Dogs have few or none of the issues with chemo that people have. Sunday, 22 May, however, the tumor on her spleen ruptured, and began bleeding into her abdomen. Although she was not yet in pain, she began to have breathing problems. Her vet came to the house, but there was nothing to be done other than give her a gentle passage out of this world. As Gerda and I held her and restrained our grief so as not to alarm her, the vet tech shaved her arm to find a vein. Dogs are smarter than we know. The moment the shaving began, before the first injection of Valium, her anxiety panting ceased. She became perfectly calm, as if she knew that she would be spared further suffering. She looked into her mother’s eyes and into mine——her eyes were golden, like her coat——and we told her we loved her, that she was a blessing beyond all valuation. . . and then a soul of perfect innocence left this troubled world. My dad was an alcoholic with a tendency to violence, a gambler, a womanizer, who was frequently unemployed or reluctant to work. My mom, on the other hand was a gem. Her name was Florence, but everyone called her Molly. She had a hard life of poverty and betrayal and illness, but she retained her optimism and her dignity. Growing up in a small town where everyone knows of your father’s misadventures can be endlessly humiliating. In fact, only in the last few years have I come to realize that humiliation was the most constant and formative experience of my childhood and adolescence. Sometimes we would get a post-midnight phone call from a barkeep who would tell us we had to come collect my father because he was either unconscious or too drunk to drive. He had the only car, so we would walk a couple of miles to wherever he was, get him into the car, and drive him home. I can recall moments like this from when I was five or six until I was well into my teen years. My mother was well aware of how much this embarrassed me. In the most gentle and confident way, she would tell me that I had no reason to be ashamed, that it wasn’t me on the tavern floor, that I wasn’t the one who had thrown up on himself, and that in time I would come to understand that enduring such moments would give me the strength and the character to handle those times when people proved unreliable, as many would throughout life. Strength and character? I didn’t believe a word of it! And yet I loved her enough to hold my head up during those trips to rescue my dad and during many other dark experiences. She taught me that life was hard for everyone, regardless of our station in life, but that all of us have reasons to be happy, too, and even joyful. She died at 53, too young, before I had any success as a writer. But every time I write a strong woman character, it’s based in part on my mother, and in part on my wife. I’ve been a lucky man to have such women in my life. On January 14th, Koontz was the guest of the Register Book Club. 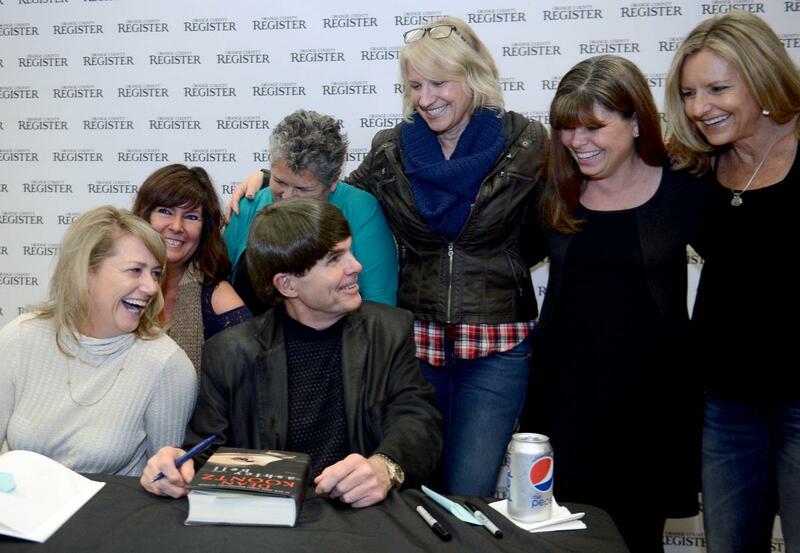 He talked about his career, signed books and posed for pictures with fans. His appearance was a rare chance to meet his fans, who filled the Register lobby in Santa Ana for two interview sessions. For more info and photos from the event, click here. 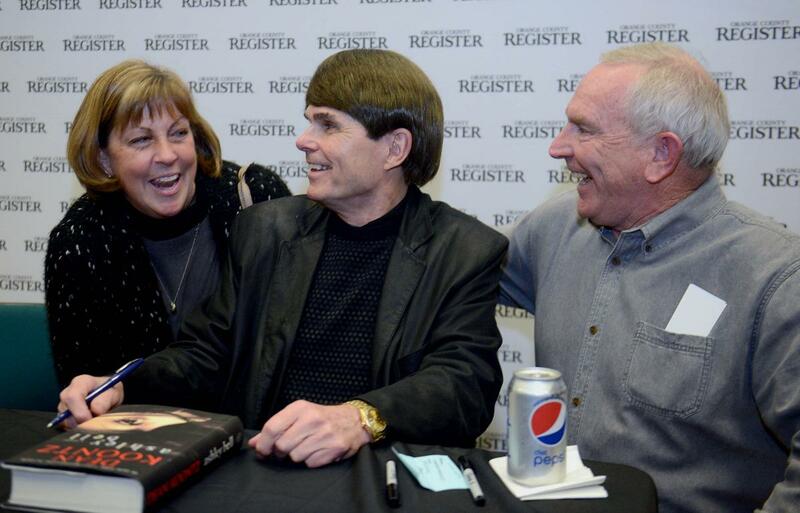 Dean Koontz shared a laugh with Cindy and Jim Vandemoortel after he signed their book Thursday. A signed, limited edition of ASHLEY BELL is now available! These $400 editions are handbound in custom handmade paper that is meant to represent fog with mysterious words and bits of words and letters floating in it, some near the surface and some half submerged. Perfect for special edition collectors! For Signed Limited Edition copies of ASHLEY BELL and more of Dean’s books visit www.charnelhouse.com. Currently, I can’t watch the news. Or read it. Or have it read to me. Most of it makes me want to slit my wrists. However, because I’m not suicidal, I feel instead compelled to slit someone else’s wrists. Never having had a desire to experience prison for the purpose of research or to add glamour to my resume as a novelist, I instead decided to stop reading and watching the news for a while, and instead to use that time to watch old movies, specifically old romantic comedies in which no one is ever beheaded (unless Quentin Tarantino has made a romantic comedy that I missed) or seeking nuclear weapons for the purpose of genocide. And I’ve seen two good ones that you might enjoy. If you really like watching current news, with all its beheadings and mass shootings and sports idols beating up their girlfriends, then ignore my advice to spend your time in a healthier pursuit: watching romantic-comedy movies instead. But it has worked for me. I no longer lie awake all night, fearing that Mike Huckabee will acquire a nuclear weapon or that the planet will be hit by the unexpected threat of Global Tepid. Two movies I’ve seen before, but not for years, proved no less watchable the second time. Return to Me is charming and funny. It reminds you of how fresh Minnie Driver was when she came on the scene, and it raises again the mystifying question of why David Duchovny didn’t move from being a big TV star to being a big movie star. He certainly had the charisma. While You Were Sleeping is a gold standard of romantic comedies. Sandra Bullock is lovely, touching, funny, adorable, delivering a subtle and heartfelt performance. (I have a thing for Sandra Bullock.) Bill Pullman proves he should always have been a bigger star than he became. And the supporting cast, from Peter Boyle to Glynis Johns to Michael Rispoli are very funny. And did I say, Sandra Bullock is just really, totally wonderful? PUBLISHER’S NOTE: Dean has had his fair share of disappointing vacation destinations. Now he wants to hear yours! Submit your disappointing vacation story on the form here and you could win a signed, limited edition Dean Koontz book! Open to U.S. residents only. Reading travel guides and glossy brochures excites my inner child. This is dangerous, because my inner child is easily excited to begin with, and the prospect of exotic adventure can get me spinning like the Tasmanian Devil in those old Looney-Toons. Gerda and I have driven across country a few times. Between points of interest (hereafter POI), I like to be on the road a minimum of ten hours, snacking as we speed along rather than wasting time in a lunch stop. We leave the highway only to refuel——or when we’re levitated, vehicle and all, into the belly of an extraterrestrial mother ship. Oh, and we stop to use a public restroom, because I can never persuade my darling wife that we should be catheterized for the trip, which would be ever so much more efficient. When we arrive at the next POI, I expect everything to be as the brochures and travel guides promised, for in spite of more than a few disappointments over the years, I always give the writers of those publications the benefit of the doubt. I don’t want to believe they indulge shamelessly in hyperbole or that, worse, they boldly lie about the charms of any POI. The first time we put a radar detector on the dashboard and set out on a continent-wide battle of wits with the highway patrol, one of our POIs was the Grand Canyon. It’s widely considered one of the wonders of the world; therefore, we were so excited that we could barely tolerate the poorly designed roadways that would not allow us to safely travel at more than 95 miles per hour. Late in the afternoon, tires smoking, we arrived at one of the most touted viewpoints, from which we were prepared to be awed by the grandeur of nature and the patient work of time as it had carved the land. We stood together at the viewpoint railing, gazing at the famous vista——for, oh, two minutes——until we could no longer pretend that the Grand Canyon was anything more than a giant hole. Then we got in the car and drove away in search of drinks and dinner. I can almost hear you besotted lovers of nature howling, but in this case, I’m sorry to say that I won’t be persuaded that Mother Nature and her version of Igor, Father Time, created a work of art. Yosemite, yes. Yellowstone, yes. But not the fabled canyon. A hole is a hole, is a hole. I’ve been told that to truly appreciate the beauty of the canyon, you have to go down to the floor of it, which requires a 9-hour mule ride in each direction. If a backside-blistering journey on a smelly mule is a condition of the experience, then I refuse to call it a Wonder of the World. There’s no tedious and dangerous mule ride to be taken to see Elton John perform in Vegas, or even to hear Celine Dion sing “My Heart Will Go On,” the love theme from Titanic, or to see the World’s Largest Prairie Dog. Once, driving across county, somewhere in the West, Gerda and I began to see big come-on signs announcing only 110 miles to the world’s largest prairie dog. Every few miles, we’d see an update: only 102 miles to the world’s largest prairie dog. Only 99 miles, 94 miles, 87 miles. . . Perhaps we’d been on the road a long time that day and had run out of topics of conversation, but soon we became so curious that we could talk about little else: Just how big could a prairie dog be in order to deserve so much signage and such a build-up? Ten pounds? Fifteen? Twenty? Soon the signs promised that in addition to the animal freak, there was “gas, good food, gift shop, sourvenirs.” This had to be some humongous prairie dog if people bought souvenirs by which to remember it. Convinced that a speeding ticket would be a small price to pay if we could get to the World’s Largest Prairie Dog ten minutes sooner than we otherwise might, I increased our speed from 85 to 100 mph. Our sense of wonder reached dazzling new heights when a sign finally declared just 10 miles to the 1800-pound prairie dog. We were bound for disappointment, of course, because when we arrived at this POI, the prairie dog proved to be fifteen feet tall and made of concrete. I won’t claim this was as big a disappointment as the Grand Canyon, but I was bummed. At least the 1800-pound prairie dog had been built in maybe a week or two, while Mother Nature took eons to carve her big boring hole in the ground. When asked where I got my ideas, I used to say from an idea shop in Syracuse, which had been owned by the same family for six generations. I was a smartass then. I’m much sweeter now. In truth, story ideas come at me from all directions and at speeds ranging from snail-crawl to speeding bullet. The premise behind Ashley Bell didn’t pop into my head full-blown, but it didn’t take days to develop, either. I have a friend, Frank Redman, who’s contending bravely with brain cancer. I wanted to know more about gliomatosis cerebri, the cancer he has, and as I was reading about it, I suddenly had the idea for a novel that begins with a 22-year-old woman, diagnosed with gliomatosis cerebri, whose doctor tells her that she has a year to live, to which she replies, “We’ll see,” and within a few days, her cancer goes into remission, though it is a type of cancer that never relents. The doctors are astonished, and with that the story is set in motion. I realized then that the novel would be about the character’s obsession with understanding why she was spared from death. This was obviously a little wish-fulfillment thing, a reaction to the truth that my friend was terminal, a way to pretend that his circumstances might not be as dire as they seemed. So far, this is not a story. It’s an opening situation. Okay, so what would the lead character——who became Bibi Blair——think about her inexplicable cure? Wouldn’t she think, Why me, why does everyone die from this disease but not me? And what was a logical conclusion she might make? Well, she might conclude that there was something she was meant to do. In the way of payback for her life. But what? Maybe. . . save the life of someone else? Someone of great importance? Now we are on the verge of having a story. All right, so once this possibility is in her mind, what if she seeks out a medium, a clairvoyant, someone, anyone, who could give her direction? And she’s given the name Ashley Bell, whereupon she becomes obsessed with saving this girl. But who is Ashley Bell? Where is she? How can she be found? Why is she in danger? From what or whom must she be saved? What if the medium or clairvoyant is not to be trusted? What if Bibi is being used, sent on a quest for reasons far different from what she believes? Now we’ve got a story. Far from complete. But a story. At this point, I had a sense that the novel was an epic quest, quite long, and that it would involve threats both natural and supernatural, though I still knew neither who Ashley Bell was nor who might wish to thwart Bibi’s search for her. All of that, I assumed, would come to me in the writing. I never do outlines. I always set out with just the initial premise, with a character who appeals to me, and see where the character will take the novel. But then, an hour or two later, when I wasn’t even thinking about the story, or when I didn’t seem to be thinking about it, a narrative twist occurred to me that was so delightful I spun around three or four times in my office chair, grinning like an idiot (a grin I know well). It is at this point that describing the source of an idea becomes more difficult. The imagination is set afire. Your mental landscape brightens, and each possible development spawns another two or three. I started to make notes in a tablet, so I wouldn’t forget anything, and another twist occurred to me, and then a third so big that I literally sprang up from the chair and began pacing with excitement, mind racing. I wanted to sit and begin at once to write. Fortunately, I had finished another project and didn’t have to wait weeks to launch upon the waters of the first chapter. So the novel grew from my concern about a friend, from learning about his cancer, wishing for him a remission, and then building a story to explain how such a thing might be possible. When I set to work on it, I knew perhaps 10% of the story. But the rest of it came, page by page, in that mysterious and exhilarating fashion, the way the best of stories virtually tell themselves. I recently said that Ashley Bell is in my top five favorites of my own novels, but lately I’ve concluded that it’s in the top three. Every once in a while, an actress or actor comes along who is so charming and watchable that anything she or he is in will be worth watching for that performance, even if overall the film is a hideous malodorous mass of . . . well, a malodorous mass of biological-system end product. That was especially true of Gene Hackman, who was riveting in great films and crappy ones alike. I’m also taken with Octavia Spencer. Everyone saw her in The Help, which was terrific. Fewer than everyone saw her in Black or White, in which she was as good or better. Somehow, though well reviewed, the film didn’t click. It’s a completely fresh and nuanced film about race relations, without the usual cliches, and her performance is delightful, touching, and beautiful to behold. Kevin Costner has that same watchability and ability to be good in a bad movie (though I admit to having all memories of Waterworld and The Postman chemically obliterated by memory reduction specialists from the CIA). He’s been in many good movies, too, and Black or White is one of them. Worth your time. I’m not Dr. Oz. I’m not even the Wizard of. But if you ever have trouble with leg cramps in the middle of the night, I now know how to avoid them. No, I haven’t cut off my legs at the knees. I have matured enough so that I no longer seize upon the first answer to a problem that occurs to me. I was having cramps so awful, they made me scream louder than Jamie Leigh Curtis in all those old horror flicks. They went on for 10 or 15 minutes, and I couldn’t walk them off, had to wait for them to relent. Now, no leg cramps. The problem is potassium deficiency. If I eat a banana every morning and every other day eat two, I have no cramps. I don’t love bananas. For all you banana lovers out there, let me hasten to say that I don’t despise them, either. Although I don’t love bananas, I like them well enough to call them “casual friends.” So I’m just doing a little public service here, because I do love my readers and want you all to be free of leg cramps. And ticks. And dangerous liver-eating parasites. Really, I want you to be free of all bad things. When I posted a piece about opening lines in my work and invited you to compete for prizes by sending in your favorite openings from other novelists’ work, I hoped enough of you would respond to populate, say, a classroom. I pictured a small and genteel group, but instead enough of you responded to form a dangerous mob. I read all your entries, and so many were good that picking the best ten was not easy. But as soon as the winners have provided their addresses, we will announce them, and the limited-edition books will be in the mail within a week. The following are from winners and near winners. By the way, those who cited various openings of mine are assumed to be vastly intelligent specimens of humanity with impeccable taste, but in all humility (I have a little), I couldn’t award prizes to them. And those who offered openings from their own stories——nice try. The no-brainer was the 119-word opening sentence of Dickens’ A Tale of Two Cities. I’m not going to quote it here, but look it up. It’s the perfect example of how a bravura writer can break all kinds of rules and get away with it. I was delighted that an old favorite of mine, the late John Nichols, was cited for his opening to The Magic Journey: “Forty years before the Pueblo electricity scam rocked Chamisville a year after April Delaney had returned home to resurrect an embarrassingly radical newspaper called El Carin, April’s father, Dale Rodney McQueen, a sometime prizefighter, medicine-oil hustler, cowpuncher, flesh peddler, and general all-around ne’er-do-well from Muleshoe, Texas, entered Chamisville seated behind the wheel of a rattletrap school bus riddled with bullet holes.” My friends, that does Dickens and Jim Butcher proud. Thanks for participating (if you did). And if you didn’t participate, what the hell’s wrong with you? We’ll have a couple of more contests, with more limited-edition books as prizes, in the days ahead.